Two adjacent markers which complement each other are treated as one marker. Imagine a time when no highway was here. Which way would you chose to get over the mountains? Although they had Toby to guide them, making their way over these steep and formidable mountains made the days between August 31, and September 4, 1805 some of the most difficult days of the entire journey for the Corps of Discovery. Captions: (top left) Map Location 1 Most of the experts agreed that the trail Lewis and Clark followed probably passed along Moose Creek near this area. From this point north their theories began to diverge. ; (top right) Map Location 2 This meadow at the end of the North Fork of the Salmon River would have been an attractive spot for the Corp to set up camp on September 3, 1805.; (bottom left) Map Location 3 This was taken along the trail north of where Lewis and Clark probably camped on September 3, 1805 according to the theories of three of the five experts. ; (bottom right) Map Location 4 Looking south from the divide between, Idaho and Montana into the North For of the Salmon River. The Corp crossed from the high mountains to the left into the cove at the head of the drainage and encamped. On September 4th they traveled up the side drainage to the right and along the divide passing where this picture was taken. long disagreed. Neither the rugged countryside nor the journal entries gives a clear indication of the path they followed. While there is some consensus about the probable camp sites of September 2nd and 4th September 3rd’s camp may not be identified until someone is able to produce a bit of metal or charcoal that can be dated to that time. On one point, however, there is no disagreement - there was no easy way over these mountains. 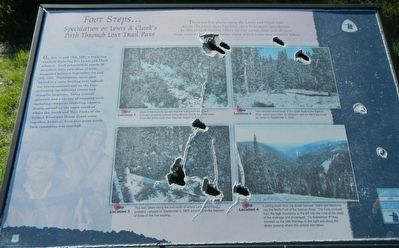 There are few places along the Lewis and Clark trail where the exact route has been open to so much speculation. In this rugged country where no way seems clear and obvious, there were a variety of theories about which route was actually taken. however, from that point north little consensus was reached. Location. 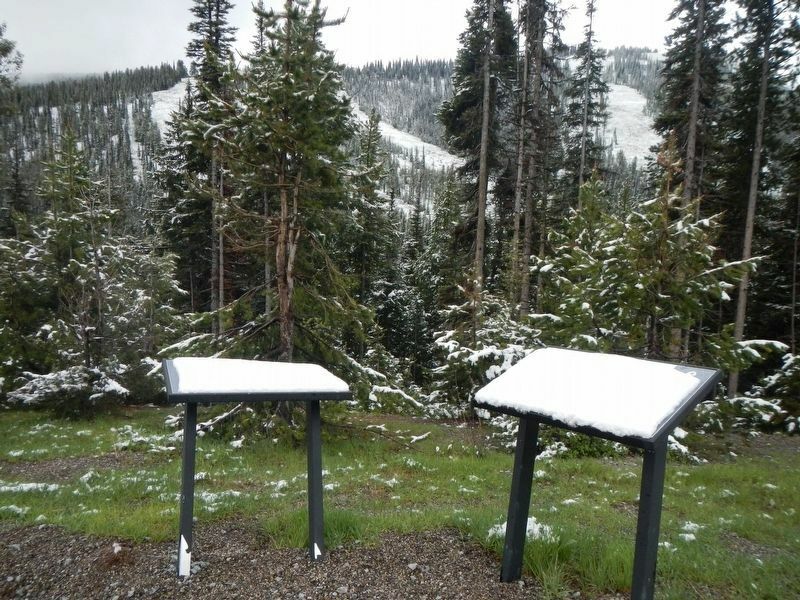 45° 40.976′ N, 113° 56.672′ W. Marker is near Gibbonsville, Idaho, in Lemhi County. Marker is on Casey Road (State Highway 93 at milepost 349) near State Highway 43, on the left when traveling north. Touch for map. Marker is in this post office area: Gibbonsville ID 83463, United States of America. Touch for directions. Other nearby markers. At least 8 other markers are within 11 miles of this marker, measured as the crow flies. Jerry Fahey’s Cutoff (within shouting distance of this marker); Which Way Did Lewis & Clark Go? (approx. 0.8 miles away in Montana); Lewis and Clark (approx. 2.2 miles away); Deep Creek (approx. 6.3 miles away); Natural Travel Corridor (approx. 6.6 miles away in Montana); A Story of Fires... to be continued (approx. 8.2 miles away in Montana); Gibbonsville (approx. 9.7 miles away); Join the Voyage of Discovery (approx. 10.7 miles away in Montana). Touch for a list and map of all markers in Gibbonsville. More. 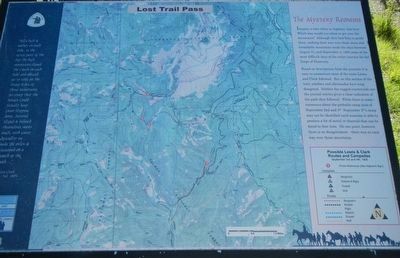 Search the internet for Lost Trail Pass. Credits. This page was last revised on September 22, 2018. This page originally submitted on November 5, 2017, by Barry Swackhamer of San Jose, California. This page has been viewed 115 times since then and 5 times this year. Photos: 1, 2. submitted on November 5, 2017, by Barry Swackhamer of San Jose, California. 3. submitted on September 21, 2018, by Barry Swackhamer of San Jose, California.